White pepper powder (白胡椒粉, Bai Hu Jiao Fen) is widely used in Asian cuisines and is a must-have in an Asian kitchen. It has a sharp, spicy, and smoky flavor that is perfect for adding a clean and light spiciness without being too overwhelming. It is spicier and fruitier, but is less complex, than black pepper. Finely ground white pepper is commonly used in Chinese or Asian cuisine and is is one of the key ingredients in the famous hot and sour soup. 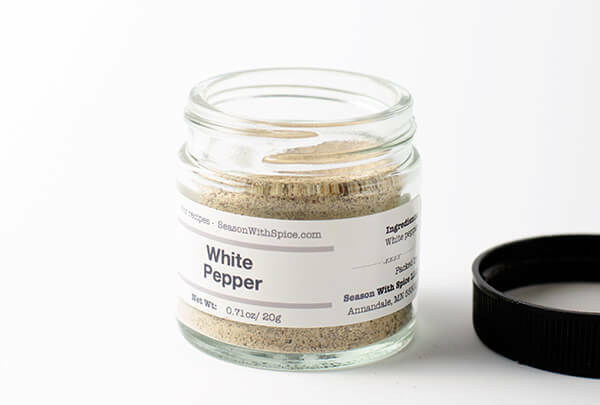 One thing to take note of when using white pepper, you should always add it after you have finished cooking the dish, because it will release a bitter flavor when overheated.